Jefferson Davis faced the greatest crisis of his Confederate presidency in the fall of 1864. Stunning Union victories and thinning army ranks forced Davis to decide whether independence or slavery was most important. In November, Davis called on Congress to reconsider the role of the slave in the Southern war effort. His goal was not simply to find more men for Lee’s army but rather to create a new Confederate identity based in the experience of war rather than in the shadows of the Old South. Exploring the debate as it unfolded in Virginia, Georgia, and Texas, differences between the Upper South, Deep South, and Trans-Mississippi South emerge. Davis waged his final campaign in newspapers as he challenged the Southern people to define a new role for the slave. Discussion of black men in gray uniforms brought forth long-hidden divisions between planters, yeoman, and poor whites. By looking for common Southerners who held neither high government office nor military position, this work paints a more complex picture of the importance of slavery within the Civil War South. By the spring of 1865, the conservative revolution of 1861 had in fact become a true revolution. The vast majority of Virginians, Georgians, and even some Texans discovered that slavery could be sacrificed more easily than Southern independence. 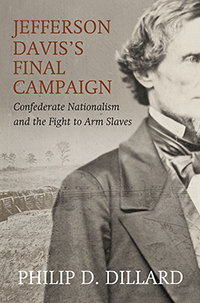 Jefferson Davis won his final campaign by convincing many Southerners that the Confederate nation was more important than the institution of slavery.